It’s a shame that the important news coming out of the summit between Russian President Vladimir Putin and US President Donald Trump about the US and Russia beginning to patch up their relationship and avoid nuclear catastrophe has been buried amid the furor over Trump’s comment doubting whether Russia was responsible for meddling in the 2016 election. After years of a declining relationship between Russia and the United States the leaders of the two countries met in Helsinki and had what they both said were constructive talks dealing with nuclear nonproliferation and other key geopolitical issues. Putin continued that only by the US and Russia “standing together” can the world overcome issues of nuclear proliferation and regional conflicts. Together the US and Russia hold 90% of all the nuclear weapons in the world. According to the American Federation of Scientists, the United States has 4000 nuclear warheads and the Russian Federation has 4300. A nuclear conflict between Russia and the United States, should it ever break out, would be the ultimate catastrophe. There would be no winner. 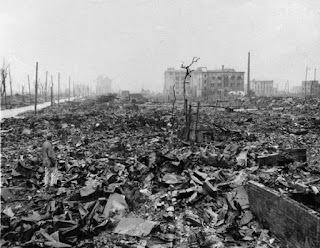 For those who might escape the immediate effects of a nuclear attack, they wouldn’t live long due to massive radiation fallout and nuclear winter. All life on the planet would be effectively ended. Negotiations between the US and Russia are imperative to avoid a potential Armageddon. Donald Trump did the right thing by going to Helsinki and meeting Putin. He followed in the footsteps of many presidents before him who have met with Russian leaders to work out agreements on arms control and conflict resolution. By the accounts of the two leaders, the summit went well and was a step towards improving US Russian relations and avoiding catastrophic conflict. But that important news was all lost amid the furor --- really hysteria --- over an inept comment Trump made during the press conference when he was responding to a question about who was responsible for the alleged hacking of Democratic Party emails during the 2016 election campaign. Trump said he wasn’t sure whether the US intelligence agencies were correct in their assessment that the Russians were responsible for the hacking, and not someone else. He seemed to indicate that he believed Putin’s firm denial that the Russian government had any role. Immediately, there was an avalanche of criticism. Political leaders on both sides of the aisle and many in the media blasted Trump for appearing to take sides with the Russians over the word of US intelligence. Former CIA Director John Brennan said Trump’s performance “rises to and exceeds the threshold for high crimes and misdemeanors,” which under the Constitution justifies impeachment. “It was nothing short of treasonous,” he said. US Sen. Richard Blumenthal, D-Conn, said that the United States was now facing “a 9/11 type emergency” due to Trump’s performance at the summit. In truth, much of the criticism and comments about “treason” were way over the top and in the case of members of the media, totally unprofessional. There is no question President Trump said a really dumb thing. But it was more a political blunder than a factual misstatement. In point of fact, Trump has every reason to doubt the accuracy of the claims about Russian hacking and election meddling. To this date, nothing --- nothing --- has been proven beyond a reasonable doubt that the Russians were behind the much-talked about hacking of Democratic National Committee emails in 2016. The main foundation for claims of Russian hacking came out of an Intelligence Community Assessment in early 2017 which blamed the Kremlin for directing the theft of the emails and then turning over the information to WikiLeaks for publication. The revelations about Democratic candidate Hillary Clinton, such as the effort by the DNC to undermine the candidacy of Bernie Sanders, was damaging to the Clinton campaign and helped Trump in the polls. The ICA, as it is known, authorized by then Director of National Intelligence James Clapper, used a “handpicked group” of analysts from the big three intelligence agencies, namely the CIA, FBI and NSA, to investigate the hacking claim. The ICA did not represent , as was erroneously reported at the time, a community-wide assessment by all 17 intelligence agencies. The assessment drew on the findings of an investigation by a private firm, CrowdStrike. The FBI itself did not do its own investigation of the hacking, after DNC officials first reported there had been an intrusion, as the agency was denied access to the email server by the DNC. Even though the agency clearly had the power to subpoena the email server, as this was a national security case, the FBI decided not to do so. Instead it agreed with the Democrats to let CrowdStrike do the inquiry. CrowdStrike’s founder is both friendly with the Democrats and also a member of the anti-Russian, neocon Atlantic Council. The CrowdStrike findings, which maintain that the email metadata showed evidence of hacking by Russian operatives, has been strongly disputed by cyber experts such as John McAfee and former intelligence officials from the NSA, FBI and CIA. Critics of the report contend that instead of the emails being hacked, there was actually a download of email information by a disgruntled Bernie Sanders supporter on the DNC staff who then turned over the information to WikiLeaks. It is disturbing that the email download scenario never got any attention from the FBI. Even the ICA report does not claim to be definitive in showing that the Russians committed hacking. “Judgments are not intended to imply that we have proof that shows something to be a fact. Assessments are based on collected information which is often incomplete or fragmentary as well as logic argumentation and precedents,” the report said. The recent indictment of 12 Russian military officials for their role in the hacking case also does not constitute firm evidence of Russian intrusion in the US election since these are allegations and have not been aired before a jury. There’s been no conviction. It also should be noted that the indictment document relies again in part on the disputed CrowdStrike findings. It is very dismaying that so many politicians and media types alike are waving the indictment around as if it’s final proof of Russian guilt. I saw Shepard Smith on Fox News the other day doing that, saying that Trump was wrong to express misgivings about who was responsible for the hacking because we now have "proof" of Russian involvement due to the indictment. Come on Mr. Smith, go back to the dictionary and find out what an indictment is. President Trump has every right to be skeptical about the intelligence community findings, due to the flawed ICA, together with the mounting evidence coming from a recent inspector general’s report and congressional testimony showing that FBI officials carried a heavy political bias against Donald Trump as they conducted their investigation of both the possible Russian hacking and collusion between the Trump campaign in Russia. It’s well known that both Clapper and Brennan disliked Trump and played a key role in drumming up support for an investigation of collusion which led to the appointment of Special Counsel Robert Mueller. This has all been part of an effort to drive Trump from the presidency, either through impeachment or resignation. Pro-war neo cons and major press outlets have backed this campaign. So far, Mueller has not been able to charge anyone connected with Trump for conspiring with the Russians to influence the election. Politically, Trump made a very stupid mistake in openly questioning the intelligence agencies. And he paid a dear price. Needless to say, the hyper controversy about Trump’s comment has totally overshadowed the much more significant development coming out of the summit, which is that nuclear-armed United States and nuclear-armed Russia have begun to start working cooperatively again on the issue of proliferation and resolving regional conflicts. This effort should be supported widely and not undermined by the continued blather about Trump-Russia collusion and Russian hacking. Endless repetition of unproven claims about collusion and mindless vilification of Russia just serves to impede the peace process and make the possibility of a catastrophic war more likely. It’s too bad many progressives and members of the Democratic Party have endorsed the Russia-gate narrative. But it’s time to change focus. Russia-gate is a waste of time and a distraction from dealing with the more central issues important to this country. There are plenty of very potent political issues upon which to wage a campaign to elect somebody better than Trump. Russia-gate is not one of them. A determined campaign centered around Medicare-for-all, establishing an equitable tax system, and slashing the bloated defense budget to provide money for education, new infrastructure and job training might well elect someone good. However flawed Donald Trump is as a president on a wide range of issues, he’s doing the right thing to try to broker better relations with the Russian Federation. The stakes are too high not to make the effort. Stephen Cohen, professor emeritus of Russian studies at NYU and one of the leading scholars on Russia, told Tucker Carlson of Fox News this past week that he was stunned by what he called the “mob violence” atmosphere in the reaction to Trump’s comments at the summit press conference. Warning that relations between the US and Russia had hit a dangerous new low, Cohen said it’s imperative to get a better relationship going.